We could go on for days, showing you stats and telling you how many people might see your wrap going down the street. You’re here aren’t you? So you’ve probably spotted some sweet-looking graphics with your own eyes. Maybe you wondered if it was painted on the car. 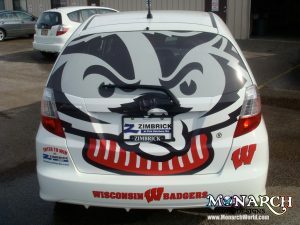 The simple answer to this question is that a vehicle wrap is a giant “sticker” that you can customize for your vehicle. We take colors, images, and designs to give a custom painted look onto the surface of the vehicle. We use pressure-sensitive vinyl that is applied by our qualified installers. Vehicle wrap material can be installed on just about any vehicle, however we primarily see cars, vans, trucks, trailers, food trucks, box trucks, and more. 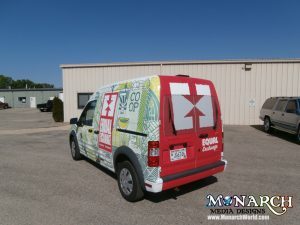 You can learn a lot more about vehicle wraps and view our gallery by clicking here. What are the benefits of wrapping my vehicle? Unlike a paint job it doesn’t affect the resale value of the vehicle, it doesn’t void a leased vehicle warranty, costs much less, can look much better than paint, is completely customizable, is easier to patch area if there’s an accident, is a cheaper to wrap one part of a vehicle than get it painted, and hides dings and scratches. Most importantly, because of it’s fully-customizable nature, it will get your business noticed. There are a lot of variables that go into pricing a vehicle wrap so it’s hard to give one universal number. Especially if we have not seen the vehicle in person.When pricing, we consider design, timing, installation including difficulty (cars with more curves are harder to wrap and can be more expensive), size of the vehicle, and the amount of the vehicle being wrapped. A complex design can increase the cost, as well as upgrades in materials due to complex curves. The quotes we present to our clients are all inclusive of what you will see and get out of your vehicle wrap. We use high quality cast vinyl, the best color matching and management out there, overlaminate to protect your wrap for UV rays and scratches, and premium installers to ensure that your wrap looks amazing. If you are comparing proposals between companies, make sure to reach out the companies and see what materials they are using, and that their installation and design fees are included in their bids. Read More about “How Much Will My Business Vehicle Wrap Cost?” by clicking here! Vehicle wraps usually last around 4 or 5 years, but can sometime last up to 10 years. It really depends on the conditions the vehicle is driven and stored in. After the the standard 4 years, the wrap should come off leaving little to no residue, returning the vehicle to its original color. It is possible if you use perforated window vinyl. Known more commonly as “window perf”, it is vinyl with little holes in it that allow light to come in, as well as let you see out of it. From inside the vehicle, it should look like your windows are tinted, while on the outside you can see a printed graphic. NOTE: In Wisconsin, it’s illegal to have window perf on the windshield or on the driver or passenger windows. However, it is legal to have window perf on the rear windshield or rear windows. Do I need to wash my vehicle before installation? Absolutely. You should wash your car the day or the day before you bring your vehicle in for installation. We always clean the vehicles prior to installation, but there is a $50 cleaning charge if the vehicle is extra dirty. Certain times of year, weather such as snow and rain cannot be helped. We do understand that things happen, but please do not have built up dirt and mud or extreme bugs when you bring it in. Every vehicle and design is different, so the timeframe is going to vary. Larger vehicles with complicated wraps and a large surface area will take longer than a smaller vehicle with a simple logo on the side. A standard wrap (e.g. full wrap of a Toyota Prius) should take about 1-2 days. We build an extra 24 hour buffer after the installation is completed to allow for the vinyl to adhere 100% to the vehicle. How do I care for my vehicle after it’s been wrapped? We actually have a whole page about this, go check it out here! 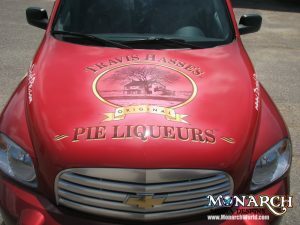 Is it easy to remove vinyl graphics from my vehicle? This is always going to depend on the material that was applied. The materials we use are all intermediate or premium grade. Vehicle wraps come off with ease within the first 5 years or so. It will come up easily when you want it to, but not so easily that someone could do it on accident. We use a heat gun to soften the adhesive and remove it. We often get vehicles in where they were done somewhere else and the vinyl breaks into pieces and/or leaves a lot of adhesive. If the vinyl has been on for a long time, it will be harder to pull off because it’s more brittle. If you are looking to get vinyl removed from another company, we have to test the removal in order to give an accurate quote. Our vinyl materials will not damage the paint on your vehicle. If you are very worried, talk to your supplier and consider pre-testing before wrapping. NOTE: If the paint is old and brittle or if you have a painted bumper, the vinyl may remove some of the paint in these cases. We have had cars come in from removal (wrapped at another local company), and the vinyl took the clear coat off of the vehicle. That is when you get what you pay for if you wrap with a low-grade material.